Young Singers continue to impress! Our GCS Young Singers group continues to grow and impress. These young people bring an enthusiasm and a vitality to GCS and it is wonderful to have them with us. They learn incredibly quickly and their youthful exuberance and the very different quality of their voices add so much. 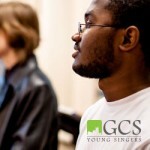 If you are aged between 14 and 18 and would like to know more about the scheme and how to join, simply check out the GCS Young Singers page. Alternatively, contact Sally Scanlon on 01242 576471, or e-mail youngsingers@gloucesterchoral.com.